The month of May brought two international artists, Christine Boiry (France) and Wahida Azhari (Germany) to our shores. Through the increasing connections made possible by social media they were able to bring their unique creative processes for us to view. Such is the power of Facebook they were welcomed, dined and entertained for the entire month by numbers of accommodating local artists who were rewarded with warmth and insightful conversation. Their spare non objective approaches culminated in two exhibitions in Sydney. 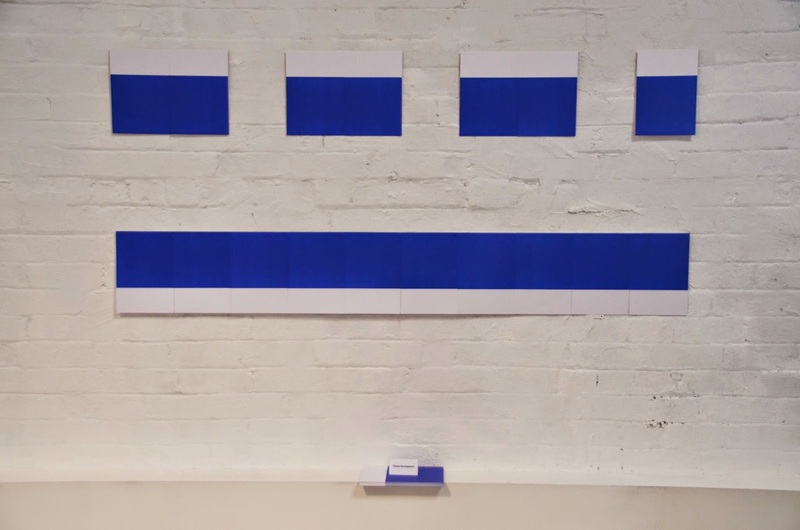 The first one at Articulate Project Space saw them teaming up with regular co exhibitors Shawn Stipling (Great Britian) and Bogumila Stronjna (Poland) in a show titled The Blue Square Project. 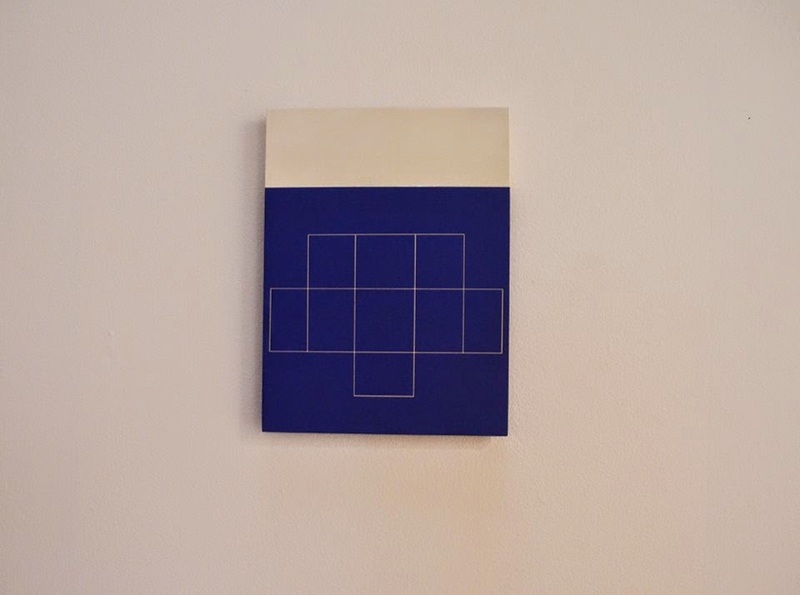 The square is offered as a challenge to reinterpret its constraints as a traditional format and its historical use as the basis for abstract art in the 20th Century. The show was curated by Stronjna. 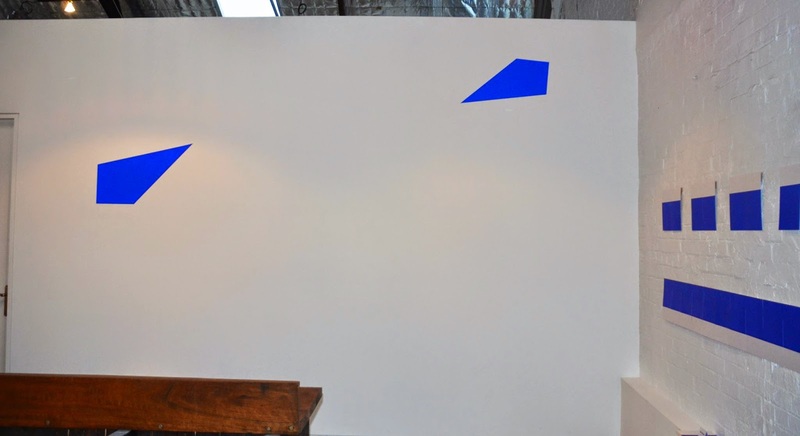 Each artist had their own conflict with the shape in an effort to bring movement, dynamism and commentary into their individual installations. Stipling utilises the suffocating affect the directive had upon him by commentating on the staidness of British housing architecture and perhaps unwillingness to employ creative vision in an increasingly pragmatic culture. 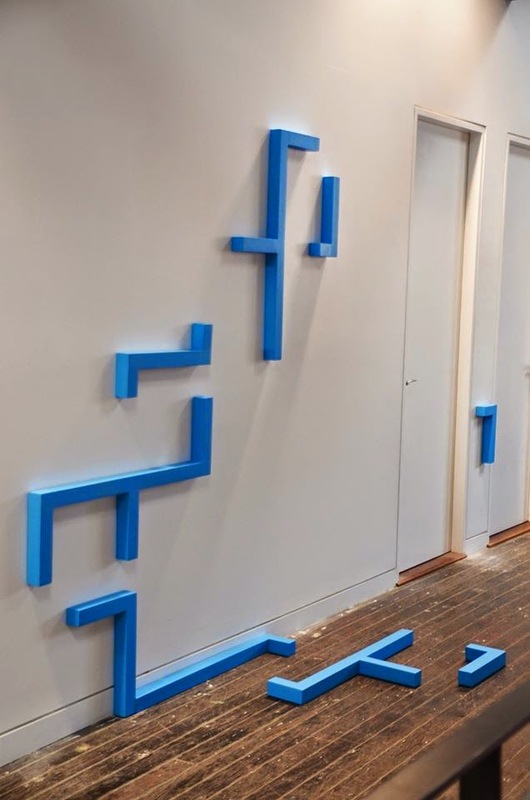 Stronjna creates a lovely wall and floor assemblage where the fragmented square has been a long-time visual vocabulary for her. 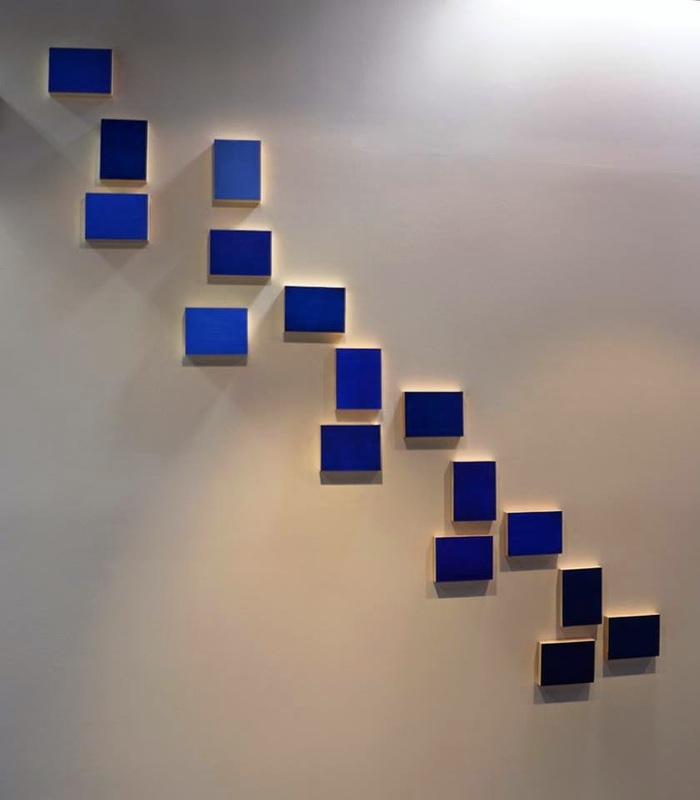 Boiry creates a beautiful cascade of retangular shapes using the whole gamut of blues from cerulean to ultramarine meticulously sequenced to create movement and rhythm while Azhari’s minimalist work is a painstaking emphasis on the dynamism of the negative space between two small blue diagonal forms. The second show a Factory 49 with Boiry and Azhari sharing the space explored similar ground without the restraint of colour limitations. The space vibrated with energy and contemplative emptiness. There’s the familiar pieces such as Joseph Lycett’s depiction of Newcastle circa 1818 and Richard Browne’s images of indigenous Australians but amongst these popular works are new acquisitions adding to the emotional history of the region and of course to the collection of the Newcastle Art Gallery. Until 13th July Novocastria will be on display in the lower section of the gallery. This exhibition represents art of the Newcastle region, fascinating in its description of the evolving settlement since the early 1800’s and also for the progression in artistic development since then. Each piece in this exhibition has a quality deserving of critique however time being of the essence for both writer and reader means this worthy toil is to be abandoned. But alas the highlights! The ANZAC legend being in the spotlight at present makes contemporary artist Archie Moore’s work pertinent. General Sanders vs Colonel Sanders 2013 questions the construction of the giant fast food outlet, namely KFC in Hunter St, on land significant to Indigenous culture. 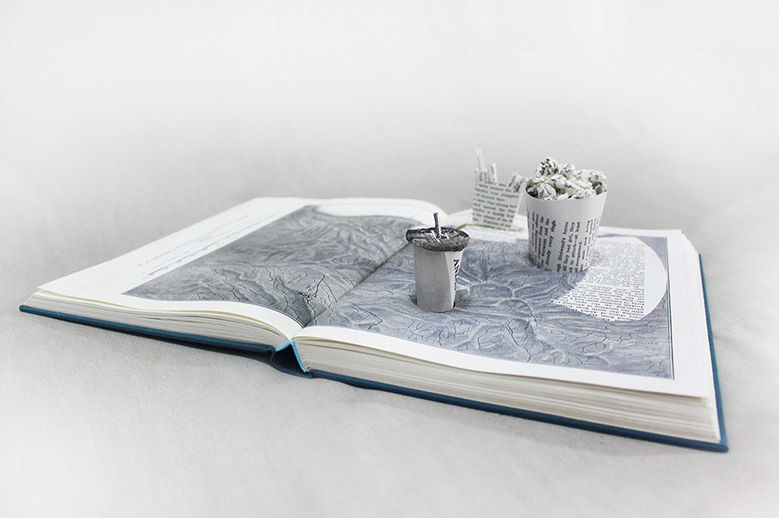 The artwork consists of a repurposed book whose content covers the ANZAC’s. Out of this, the western diet of chicken, chips and soft drink is produced as a miniature paper sculpture. It’s a relevant artwork covering many ironies not least the positioning of significant architecture to promote a product epitomising the industrialisation of food to the detriment of the human body. Joseph McGlennon’s Thylacine study number 4 is not directly associated with the local region though its clear message and also its relevance as a new acquisition make it a welcome addition. This constructed image of a taxidermied Tasmanian Tiger placed prominently in the sublime wilderness demonstrates the fragility of the environment when dominated by a being that places its own importance before the species of others. 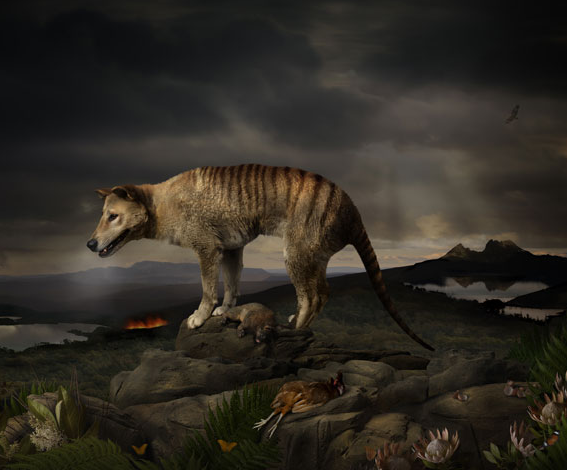 The inhospitable landscape of Tasmania allowed the Thylacine to survive until European settlements took hold and this allegorical work prompts the viewer to acknowledge the mass extinction taking place on earth at this very moment. Our species capacity to tame, manipulate and destruct is bravely recognised in McGlennon’s work. It’s encouraging to see local artist’s finding voice in this current exhibition. The recent acquisition of Liam Power’s work “Land Bulk Study nos. 1-9 2013” is a scholarly endeavour in colour and shape. Michael Bell unites Dog Beach and a ceramic vessel to create a stunning object of art. And Isabel Gomez rewards the viewer with a pared back view of the industry and the harbour. The curatorial proficiency demonstrates a unified approach to the merging of diverse art periods and techniques. A cohesive exhibition is the result which further proves the value of our Newcastle Regional Gallery.